Born in China to British missionary parents dedicated to saving the souls of the Chinese peasantry, Ming-Mei is bundled off at the age of 6 to the Lushan school. Perched on a staggeringly beautiful misty mountain of spiritual importance, Lushan is a boarding school for the children of British missionaries, somewhere that offspring can be conviniently stored whilst the parents are off continuing God's work. Despite most of its pupils being being born and raised in China, Lushan is strictly English, and Henrietta S. Robertson is to be Ming-Mei's name from now on. She is to learn to be a good Christian so that she too can grow up to bring the Gospel to the more overlooked and remote corners of the globe. The main section of the novel opens in 1941 and concentrates on Etta's story from the age of 10. A wildly imaginative daydreamer, Etta is somewhat alienated from her dorm-mates, many of whom are quite humourless and pious; middle aged women in little girl costumes. She craves attention from Dorm mistress Aunty Murial, a young Scottish missionary who takes the girls on brisk mountain walks and paints their portraits in watercolours. Etta immediately strikes the reader as an incredibly lost and lonely girl, adrift from her idolised parents (snapped like the symbolic red string of Chinese departure custom) and noticeably different from the other girls. She is desperate to be special, revealing herself a prophetess in direct contact with God and subsequently she sets about making prophecies, declaring the others Prophetesses too (Hark, it is the Lord's intent) and unknowingly laying the foundations of tragedy, trouble and ostracism. From the very beginning she suffers from a bit of an identity crisis; she is Etta to her peers, Henrietta to the Lushan staff, Samantha the Prophetesses during the days of the Prophetess club, self declared 'Mother' to Twelve, a local toddler she befriends and Ming-Mei when outside of Lushan. Whilst Etta as a character is mischievous, funny and strong willed, her identity is paper thin and is constantly being switched and altered. I loved Mackenzie's descriptions of the wild peaks of China, the lush forests and the living mountain, the mists, waterfalls, crumbling temples and the delicate flowers. I loved the idea of the 'Thin Places' where people are spiritually closer to the other world. Lushan, for all its strange evangelical inhabitants, seems like paradise. It makes the war, gathering pace around them, seem all the more remote and impossible, until it is right at their door. When the war arrives and evicts the staff and the children from their home, Etta has to grow up rapidly. The third portion of the book shifts the narrative to a Japanese civilian interment camp and we see a child's eye view of malnutrition, black markets and berri-berri, which reminded me a little of The Narrow Road to the Deep North, only without the building of the railway. Interred with the rest of Lushan's staff and students, the only relationships Etta has ever known crumble; Aunty Muriel is now just Muriel, no longer her guardian, she is now someone who looks after the sick, her Dorm mates are now just 'other girls'. She's no longer a pupil, not really a daughter. She's totally on her own. 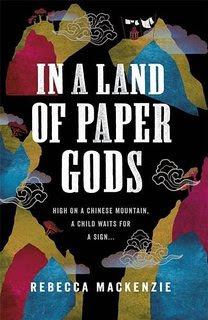 With its themes of religion, identity, war, isolation, displacement and being caught between two vastly different cultures, I was really impressed with In A Land of Paper Gods and thoroughly enjoyed reading it. I loved Mackenzie's mystical and evocative prose and her Huck Finn-ish protagonist, a parent-less girl left to navigate the boundary between right and wrong. I found that the structure of the book really worked too; the inclusion of a few pages from Muriel's diary were really interesting additions as it showed how repressed she was, how much she cared for her girls but wan't really supposed to show it. Muriel became a much more rounded character during her time in the Japanese camps, when she stopped being a Missionary and became a survivor. It's such a compelling and haunting story, part coming-of-age, part love letter to China, part boarding school tales. The second Sino-Japanese War is an interesting and eye-opening backdrop, an era and a War that I didn't even know happened and seen from the perspective of a child, it's fascinating.